This is our holiday main meal for the year. It is a delicious combination of root vegetables and fruit. The nutmeg really adds a lovely flavoring to the chestnuts and walnuts. Prepare a loaf pan with spray oil or vegan margarine. Line the pan with baking parchment making 2 extra large strips, one for the length and one for the width, both extending over the edge to enable easy removing of the loaf later. Again, grease the baking parchment. Pulse the prepared chestnuts to make chunky crumbs in a food processor. Add the walnuts and pulse again. Place the chestnut and walnut crumbs into a large bowl. Melt 1 tablespoon of vegan margarine in a large pan. Add the chopped onions and saute until glassy. When the onions are done, add to the chestnut/walnut mixture. Peel the parsnips, remove the tops and carefully slice in half lengthwise. Place in a pot of boiling water with a bit of lemon juice and boil until al dente (5 -6 minutes depending on thickness). Prepare the 2 egg replacements. Add the dried breadcrumbs to the chestnut-walnut mixture. To the chestnut-walnut mixture, add the sage, nutmeg and a pinch of salt and pepper. Add the egg replacements and stir to an even mixture. You may need to add a bit more water to make mixture stick together. You don’t want it too wet, but you do want it to be able to form a loaf. Place the cranberries and sugar in a pan and simmer for about 10 minutes. You want the sugar to melt and the cranberries to pop and the mixture to stick together. In the original frying pan, melt the rest of the vegan margarine and add the agave. Lay the parsnips in the mixture and cover both sides to a light golden color. Cut the parsnips so they will fit evenly in the bottom of the loaf pan, using the widest part, and alternating to fit. Chop the unused parts of the parsnips and add to the chestnut-walnut mixture. Evenly spoon the chestnut-walnut mixture over the parsnips. Level the top of the mixture and add the cranberries to the top. Again evenly spread the cranberries. Cover the top with aluminum foil and place int he oven to bake for 1 hour. When the loaf is ready, remove from the oven and allow to cool slightly. Place a serving dish on top, then turn upside-down to remove the loaf from the pan. Peel the baking parchment away and garish the platter with rosemary or other green herbs. We enjoyed the meal with Brussels sprouts and cranberry sauce. 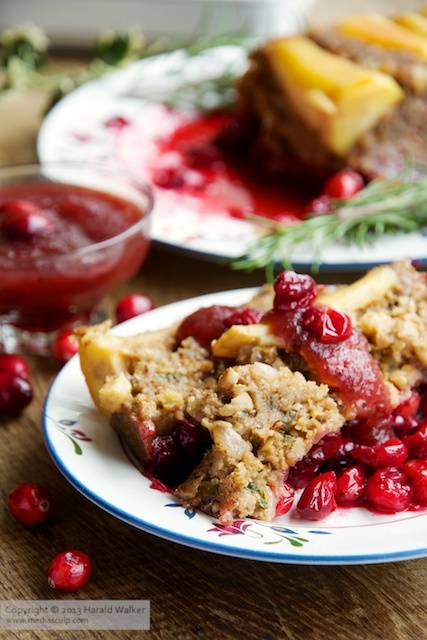 Posted by Chris Walker on December 20, 2013 in Chestnut, Cranberry, Main Dishes, Parsnip, Walnut.